Bruce Korosa (Tinley Park, IL) will be celebrating his 52nd Musical Career Anniversary on Sunday October 5 2015. Being born into a musical family, Slovenian and Polish music was instilled in Bruce at an early age. The late Eddie Korosa Sr. “America’s Prince of Polkas,” Bruce’s Dad, guided him to become a musician along with many other icons in the polka field. At age 7, Bruce started playing the accordion and used to play at his Dad’s “Baby Doll Polka Club” in Chicago on Sunday afternoons for the weekly radio show. At age 10 Bruce took on another instrument, the drums but still continued with the accordion. In just 4 years at age 14 he went on his first professional job which was a wedding along with continuing to perform on the weekly radio show at the Baby Doll with other young musicians, such as Joey Miskulin (Nashville, TN) and lifelong friend Bob Doszak (Joliet, IL). Bruce’s cousin Roman Possedi would let him sit in as the drummer at the club but also took him on a few jobs in those early years. Bruce formed his own band titled “Bruce Korosa and the Chargers.” While Bruce played accordion with his own band, be was always thrilled to fill in with some of the greatest entertainers in the polka field. One of the highlights of Bruce’s early career was when “American’s Polka King” Frankie Yankovic would come into town and give him a local job or when Frank and the band and Bruce would jump on the old Yankovic bus and play out of town. Bruce has traveled throughout the country being a “Weekend Warrior” since he had a full time job during the week. Polka music has always been in Bruce’s blood and it has always been a huge part of his life. He has had the honor of playing throughout the Midwest, in Vegas, Florida, and for countless weddings, anniversaries, conventions, picnics, nursing homes, and dinner dances. From 1978 to 1985 Bruce was a drummer for the Roman Possedi band along with his cousin Steve Juricic(Sarasota, FL) In 1985, still loving the drums and Cleveland Slovenian Style Polkas he joined up with two talented musicians along with Steve. Joining the band was Ron Kramerich (Joliet, IL) accordion, and Don Gudac (Joliet, IL) on banjo and guitar. The band stayed together for 5 years and were friends prior to playing together for many years and continue to get together whenever possible. At the end of 1990 Bruce’s oldest son Brian joined the band to play the drums while Bruce went back to the accordion. Brian had graduated from Providence Catholic High School and Bruce thought it was time to bring him on the bandstand. The band now consisted of Bruce, Cousin Steve and Willie Rache (Pling-Plink). Brian stayed with band until 1995 when he graduated from Lewis University and went into the business world. In 1992 Bruce took on a new adventure; producing and directing the first on stage polka party at the Rialto Square Theatre (Joliet, IL). The show featured the legends in the polka field to a sold out crowd of 2000 people. Icons included “America’s Polka King” Frankie Yankovic, “America’s Prince of Polkas” Eddie Korosa Sr and the nation’s #1 polka band, Eddie Blazoncyzk and the Versatones along with big bands and ethnic dance troops. The show continued to be a huge sell out until the last show in 1996. It was a tremendous endeavor but it was a fantastic accomplishment for Bruce to be able to pull together this first time ever event. The Bruce Korosa Orchestra recorded two cuts on Eddie Blazonczyk’s Christmas CD “Christmas in Chicago.” Bruce also sang on Eric Nothkamper’s release “I Don’t Wanna Mambo” a tribute to Yankovic. Bruce released his first CD “Finally” in 1988 and it was re-released in 2002. Another change came along for the Bruce Korosa band in 1995: Bruce’s son Kyle now joined the band as the drummer. After graduation from Providence Catholic High School he entered Lewis University and picked up where his brother Brian left off. While still working in the business world, Kyle continues to help his Dad on the bandstand. At this time another talented accordionist joined the band, Ron Perli(Oak Forest, IL). Ron played with Bruce’s dad back in the 50’s and 60’s and listening to his music is like hearing Joey Miskulin and Grant Kozera all at the same time. In 2006, Bruce’s friend and most talented musician Bob Hoge (St. Charles, IL) joined the band full time after Ron Perli’s retirement. Bob Hoge plays the accordion with great zeal and taste and also the old Yankovic touch like Joe Sakardi and Topps Cardoni. Other musicians who have filled in with the Bruce Korosa band are Grant Kozera (Milwaukee, WI), Diamond Steve Brunton(Milwaukee, WI) Bacon Man Doug Krueger(Milwaukee, WI), Don Gudac(Joliet, IL) Greg Watrack(Roselle, IL), Bill Smhra(Momence, IL),Jeff Winard(Milwaukee, WI), Ron Zola(Joliet, IL) and Dr. Paul Stec(Frankfort, IL) One of Bruce’s longest running performances was for over 25 years once a month at the American Slovenian Home in Joliet, IL. For 10 years Bruce has taken his once a month performances to the American Legion Post #1080 also in Joliet, IL. Korosa’s annual appearances at festivals, church dances Oktoberfests and picnics have kept this musician busy through his 50 years on the bandstand. 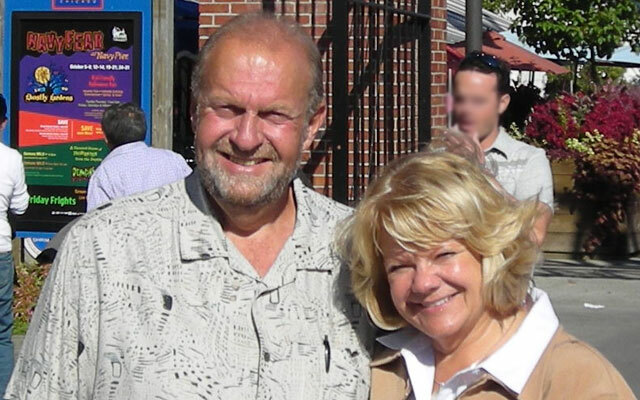 Bruce and his wife Kathy of 45 years have had their own polka radio show for over 33 years. The “Polkas on Tour” radio show can be heard every Sunday from 9:00am to 10:00am over station WJOL 1340am, Joliet, IL or over the internet on WWW.WJOL.COM. Bruce features all types of music and bands and enjoys receiving requests from his vast listening audiences. Bruce said “Coming into our audiences homes on Sunday morning is great fun. Some of our listeners have been with us from day one and have become a part of our polka family. They are a great group of people and it is my pleasure to bring joy and happiness into their lives through music. I became a musician and DJ not for myself but for the people who tune in our radio show or come out to see me play.” The “Polkas on Tour” show is the only radio show that opens up its show with two of “America’s Polka Kings” songs. years and have two sons, Nicholas 11 years old and Cal 8 years old. Kyle (39) Bruce’s younger son took over for Brian and has been drumming for his dad for 21 years. Kyle has a son, Kristopher age10. In my 52 years as a musician, I’ve met so many great and talented musicians and so many fantastic people that I have performed for. If it wasn’t for these people who love music, I could not have lasted 52 years. Most of all I want to thank my wife Kathy and sons Brian and Kyle for supporting me and for always being there and helping me; and a special THANK YOU to my father-in-law Hurricane Andrew for being there for me for the past 45 years. I love the music, having fun and putting smiles on people’s faces when playing their favorite songs. With the help of my wife, sons, and grandchildren, I hope that I will be able to keep playing and celebrate many more years in the polka field. For more information regarding the Bruce Korosa Orchestra or the “Polkas on Tour” radio show, contact Bruce at 815-463-0950 Or PO Box 552 Tinley Park, IL 60477, email polkasontour@sbcglobal.net .